Showers early, then cloudy in the afternoon. Thunder possible. High 52F. Winds NW at 10 to 20 mph. Chance of rain 50%..
Overcast with rain showers at times. Low 41F. Winds N at 10 to 20 mph. Chance of rain 40%. Editor’s note: The following was written by Bob Hartzler, Iowa State University professor of agronomy, and Meaghan Anderson, ISU Extension field agronomist, for the Extension Integrated Crop Management website Feb. 1. 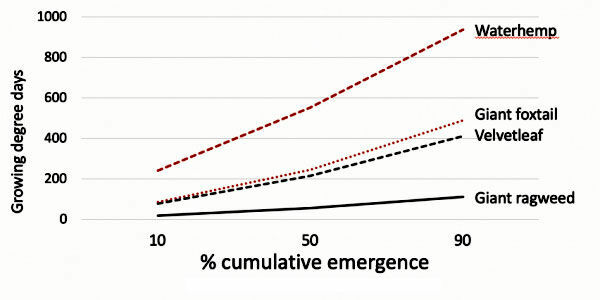 Waterhemp requires more than twice as many growing degree days to reach 50 percent emergence as giant foxtail or velvetleaf (see Figure 1), resulting in much of the population emerging after mid-June. The layered residual system is one of the best ways to reduce late-season waterhemp escapes in soybean. It involves a split application of herbicides with residual activity — the first application is made at or near planting, and then additional residual is included with the POST application. Numerous products are available for the first application, but it is important to select a product that is highly effective on waterhemp. For fields with heavy waterhemp pressure, the Group 14 and 15 herbicides will provide the most consistent control. Group 15 herbicides are the only products with sufficient residual activity to be included with the POST application. Since the goal is to extend control later into the season than typically achieved with preemergence products, the layered residual approach requires the maximum labeled rate for the soil type. Typically 60 to 70 percent of the preemergence herbicide is applied at planting, and the remainder in the second application. Three weeks after planting is a good timeframe for the second application in most situations. Even if few weeds are present at the time of this application, it is critical to include an effective POST product to control any emerged weeds. If the strategy can result in cleaner fields than currently achieved, the reduction in the seedbank will reduce the threat of new resistances. 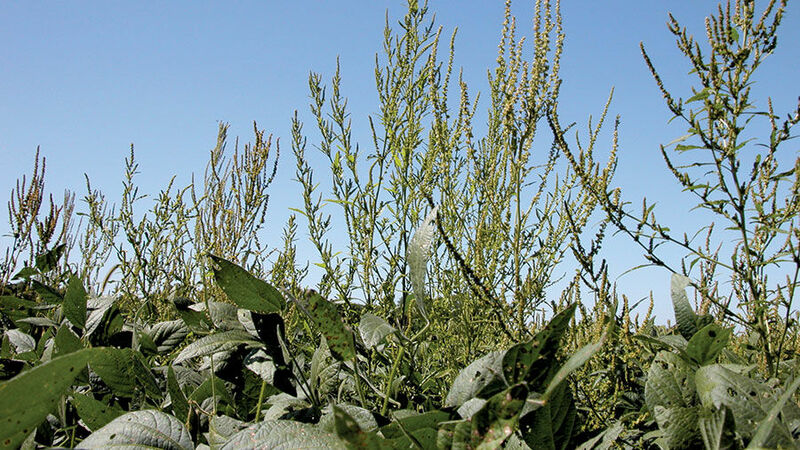 Not every field may require this aggressive approach to manage weed problems, but fields with consistent late-season waterhemp problems will likely benefit from a full rate of residual split between the premergence and POST applications.